For those of you not familiar with it, the Modern Drummer Festival Weekend 2001 takes place each year over a weekend in May. It's held at Montclair State University in Montclair, New Jersey and is always sold-out at least two full months in advance. (So next year, order your tickets well ahead of time!) Why? It's a great place to go to catch performances and drum clinics by some of the greatest drummers in the world (both veterans and newcomers). Plus, it's a great place to get away from it all and just talk drums for a solid weekend. For those of you who couldn't make it this year (the Festival was held on May 19th and 20th), fear not. I was there and I've got the photos and reviews to prove it. Because there was so much going on, I could only fit the Saturday performances into this week's feature. I'll bring you Festival Sunday next week (See the sidebar). This innovative percussion ensemble first appeared in the US at the 1993 MD Festival Weekend. These guys combine traditional Scottish pipe-band drumming with drumset playing, Latin percussion, and more. Their unique style has won them acclaim at drum shows in Koblenz, Germany, Canada, and at the Percussive Arts Society International (PASIC) Convention in Nashville. Their segment opened with drum major Jackie Houlden performing rudiments on a traditional marching drum complete with fancy backsticking. After Jackie demonstrated some of the basic drum rudiments, he brought out four more members of the group to play a drum fanfare ensemble piece. Up to this point it reminded me of a traditional marching-style percussion ensemble, until another Black Bottle member, Gary Montgomery, came on stage and sat behind a drumset. This is where things really got interesting. Gary began playing solo on the drumset and was soon joined by five synchronized snare drummers. This escalated into a rhythmic question-and-answer session between the drumset and the five marching snare drums. Before the end of the piece, temple blocks and tom-toms were added to the mix. Typical marching-style rudimental percussion ensembles are know for their precise synchronized drumming and the Drums of Black Bottle certainly have no lack of that, but what makes them unique is the way they incorporate Latin percussion instruments and multiple drumsets into their performances. Next was an interesting piece that began with a lone snare drummer who was joined by two tom players whose accents were made doubly effective by synchronized accents with the drumset player's bass drum foot. Another segment brought out three tom players working in unison along with two drumset players. Yet another bit had five snare drummers playing in unison with two drumset players. The group performed an ensemble piece playing on five matching equipment setups that included snare, hi-hat, cowbell, and ride cymbal. There was also another cool segment where they played swing ride beats in unison with brushes on the snare drums. The final piece was a terrific display of all that went on before and more. Over 15 minutes in length, they pulled out all the stops on the final number as the eight man ensemble (including two of the members on full drumsets) all played together. After witnessing The Drums of Black Bottle play I can understand why they are considered unique and innovative. In case you're wondering if this is a full time gig for these guys, it's not. Here are the players and their current occupations: Andy Gillespie (Telecoms Project Manager), Jackie Houlden (International Cymbal Sales Supervisor), Gordon Hastie (Heating Engineer), Liam Chalmers (Laboratory Technician), Alan Parker Drum Shop Manager), Gary Montgomery (Chef), John Walker (Vehicle Builder), and Scott Young (Banking Rep). See the sidebar on this page for more info on the group, who take their name from Black Bottle Scotch Whiskey. Son of jazz saxophonist Oliver Lake and "new" kid on the block (he has been playing professionally for almost 10 years), Gene has become a highly in-demand player. His combination drum clinic/performance was well received by the drummers in attendance. Gene gave some instruction on his approach to playing odd-time signatures. Gene also explained how he approaches soloing over difficult odd-time signatures by applying both harmonic and rhythmic voice leading, as well as the importance of finding something that you can lock into when laying down the time. Gene was accompanied by David Fiucznyski on guitar, Reggie Washington on bass, and Frederico Gonzalez Pena on keyboards and from his opening number "La Fiesta" by Chick Corea to selections from his own CD "Cycles" on his own label Passin' Thru Records, Gene had the total attention of the audience. (See sidebar for more info on Gene and his CD). Next up was Gary Novak, who has worked with Maynard Ferguson, Lee Ritenour, George Benson, Chaka Khan, and others. He now works with Alanis Morissette. For the Festival, he brought along some sequences (that he programmed himself) to play along with. He opened by soloing off of a funk pattern that he played to a simple, repetitive chord sequence. Following his opening drum bit, Gary expressed his appreciation to Modern Drummer for asking him to the Festival and said that he has been reading MD magazine since he was a young child. Although his clinic covered ideas on drum soloing, Gary (very wisely) stressed that to keep working, we drummers must realize that soloing is NOT our main gig. Keeping good time is much more important. More tips: Ask other musicians (not drummers) what they like about drums and learn how drums relate to the other musicians in the band. Try playing eighth-notes for the first two bars. Then play eighth-note triplets for the next two bars. Switch to thirty-second notes for the next two bars. Finish the eight-bar phrase by playing eighth-note triplets for the last two bars. He explained that this approach takes the listener through an interesting range of moods from mellow to incredibly intense and back again, depending on which note combinations of notes you choose. Personally, I like this approach to drum soloing. It makes solo work much more interesting. Try it, I think you'll like it too. Cindy has gotten a major rep as a pop drummer due to her long tenure with singer/songwriter/guitarist Lenny Kravitz but did you know she was also heavily into jazz? On her downtime from Kravitz she tours with her own jazz group, which features Carlton Holmes on keyboards, JD Allen on sax, George Mitchell on bass, and David Gilmore on guitar. Cindy brought them with her to the Festival and right from the opening number "Arcadia," a yet to-be-recorded tune, the crowd went wild over Cindy's drumming skills. She began an extended solo by alternating between loud and soft single strokes, she added in some bass drum kicks, tom-tom and cymbal combinations, and topped it off with singles strokes. But she wasn't finished yet. This was a long song, lasting more than 15 minutes, and Cindy was energetically on top of it all the way through to the end and the audience loved her. The first (loaded) question: Which band would you rather play with, Lenny Kravitz or your own? Cindy's diplomatic response: Lenny is great, he's like a brother. I love playing with my band because it's creative. A 9-year-old girl in the audience asked: How long have you been playing drums? Response: Since I was 8 years old, and that's a long time. She was then asked how she interprets Lenny's music (because he writes out the entire drum part). Cindy said that she generally plays it as written but adds her own spin to it as well. Question: If you could play another instrument, what would it be? Response: Piano. Question: What made you want to play the drums? Response: I don't really know, I just love the instrument. Question: Do you tune your drums differently when you play with Lenny and when you play with your own jazz group? Response: Yes. I tune them to be less open and lower with Lenny. Following the question and answer session, Cindy treated the audience to another performance with her group this time showing off her skill with brushes. Then she concluded her segment with another extended drum solo. Cindy, who has worked with Sam Rivers, Joe Henderson, Larry Coryell, Don Pullen, and others, also mentioned that Tony Williams was her favorite drummer and it shows. Her jazz style is very dynamic and energetic, not unlike that of the late Williams. All in all, I was impressed by Cindy's performance. She truly loves to play and it shows. 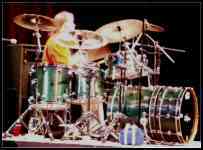 Before moving to the US in 1996, Virgil was already a successful touring and session drummer in his native Australia. He has the ability to play both jazz and power groves with equal dexterity. When Virgil appeared at the 1997 MD Festival, he wowed the audience with his impressive hand and footwork. This time around was much the same and he brought his group "Planet X" (featuring Derek Sherinian on keyboard and Tony MacAlpine on bass) with him to share the stage. Power rock from start to finish. Virgil eschewed the clinic portion and instead blew with his band straight through his segment of the Festival and the audience of a thousand drummers dug it. Planet X performed tunes from their "Universe" album along with new material and Virgil was in top form, not only with technique but in the flash department as well (complete with twirling sticks). This is one guy who spends lots of time practicing his craft and it's easy to tell. Great stuff. 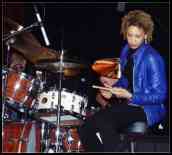 Click here for coverage of the Sunday performances from the Modern Drummer Festival 2001. 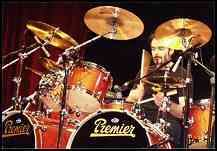 It includes two new MD undiscovered drummers, Lenny White, Carmine Appice, and more.